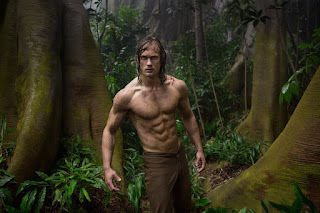 An adventure film, The Legend Of Tarzan tries to breathe life into the fabled character created by Edgar Rice Burroughs but gets trampled by a dull script riding an overabundance of computer-created beasts. In the late 1880s, envoy Léon Rom (Christoph Waltz) is dispatched by the near-bankrupt Belgian King Leopold to secure the diamond treasures of the Congo. Rom strikes a deal with local Chief Mbonga (Djimon Hounsou): in exchange for the diamonds Rom will capture Tarzan and hand him to Mbonga. Tarzan is John Clayton III (Alexander Skarsgård), the Baron of Greystoke, currently living in England with his wife Jane (Margot Robbie). He was an infant in Africa when his father was killed and John was raised by apes before meeting Jane and being rescued as a young man. He has phenomenal abilities to communicate with wild animals and travel at lightning speed through the jungle. Falling for Rom's arranged ruse, John travels back to the Congo with Jane and American veteran George Washington Williams (Samuel L. Jackson), who is investigating slavery. Rom and his soldiers catch up with them but capture Jane instead of John. With the help of George and local tribesmen, John becomes Tarzan again and has to rescue his wife and stop Rom before he gets his evil hands on untold riches. Directed by David Yates, The Legend Of Tarzan is a limp attempt to jump-start a franchise in an era already drowning in superheros. Despite adopting a welcome grim and irony-free tone, the film's plot is one long and boring chase, as Tarzan, George and their buddies trudge through the jungle chasing Rom's slow boat to nowhere. The pacing is laborious, and the editing often truncates scenes at odd moments, not that any of it matters. The film relies heavily on CGI creatures, and for fans of animals created from pixels, they are all here, with a wondrous but artificially created African species appearing at the rate of one every eight minutes or so: lions, hippos, crocodiles, ostriches, elephants, wildebeests and of course lots and lots of apes all make their compulsory appearances, often for no narrative reason whatsoever. Elsewhere Alexander Skarsgård takes off his shirt frequently to expose a chiseled physique, but is an otherwise humourless central character. Margot Robbie is primarily wasted into an old fashioned damsel in distress role, chained to a railing for most of the film. Samuel L. Jackson is dreadfully miscast as essentially a sidekick, while Christoph Waltz phones in yet another performance as the smarmy villain. With thin characterizations and a threadbare plot The Legend Of Tarzan is old fashioned in a bad way, and over reliant on unconvincing new technology in an equally bad way.